NEW YORK, Nov. 25, 2014 – The definitive resource for interior designers, architects and other design professionals, Interior Design magazine’s annual “Best of Year” Awards honors both products and projects and is a much-anticipated event in the design world. 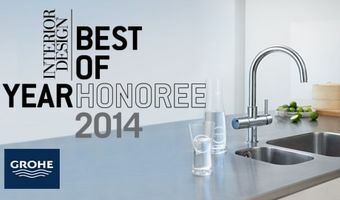 The selection of GROHE Blue® Chilled & Sparkling as one of four finalists in the Kitchen: Fittings category is a testament to the product’s exceptional design and performance. “We’re honored to receive this recognition of our pioneering design that incorporates innovation and sustainability as well as the superior quality that defines the GROHE brand,” said Cheryl Dixon, Head of Brand and Trade Marketing for GROHE America. Combining the modern look of a designer faucet with a high-performance filter, cooler and carbonator, GROHE Blue® Chilled & Sparkling is as easy to use as an ordinary kitchen faucet. The right lever on the faucet is used to mix hot and cold tap water as usual, while a single turn of the left handle provides filtered and chilled water, another turn for medium sparkling and a third turn for full sparkling water. It is also equipped with two separate internal waterways to ensure that once the water has been filtered, it never comes into contact with anything that may alter taste. Eliminating the need for plastic bottles, it pays for itself in less than 250 days, saving nearly $400 in the first year of use. Award finalists were selected by designers and architects via an online vote in October. Winners will be chosen by Interior Design Editor-in-Chief Cindy Allen and a jury of design leaders, and announced December 4, 2014 during a celebration in New York City. Winners will also be featured in the December issue of the publication. In other accolades, GROHE Blue® Chilled & Sparkling also received an Honorable Mention in the Kitchen and Bath Business “Product Innovator” Awards. GROHE faucet and shower products are distributed in more than 180 countries and represent nearly 80 years of excellence in European design, innovation, engineering and quality. GROHE America’s headquarters are in the heart of New York City’s Flatiron district and houses the GROHELIVE! Center, an interactive showroom created for inspiration and collaboration.